Okay, so we're always up for a new experience. We had read in our itinerary that our campground at Aabadi Mountain Camp had "flush toilets with bush showers". So we were kinda curious about that. I showed in today's earlier post that our campground here is pretty basic, and we have no problem with that. But we hadn't seen all of the facilities yet. 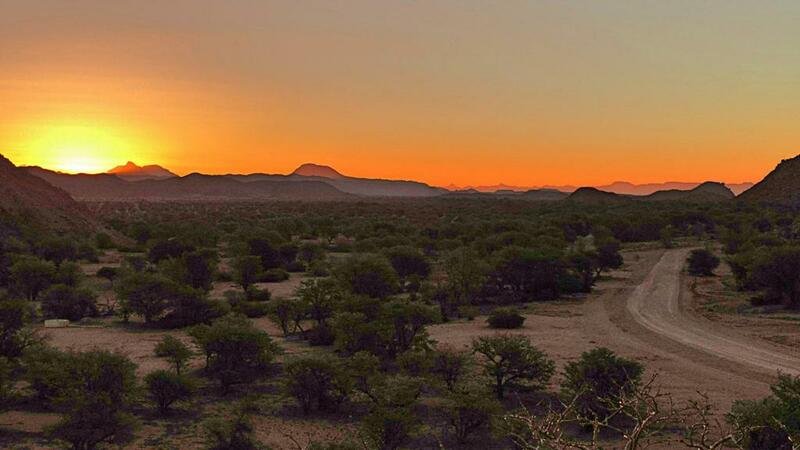 Actually, we quite liked it in Damaraland. The scenery reminds us of Arizona. Except with elephants! Yes, there are wild elephants in this part of Namibia, and we saw them run (yes, run!) through the riverbed beside where we are parked. Sorry, no photos of that odd event, it happened too quickly. There's a basic little covered bar with books and magazines where you can waste away a hot afternoon. The temperature was about 35C (95F) and we did spend a few hours sat in the shade yesterday. Comfortable spot to waste a couple of hours. Our campsite. Hey, who's that in the bottom right? Yes, there are two dogs at Aabadi Campground. Odie and Hix. Hix, pictured above, made it a point to become friends with us, and for his efforts he was rewarded with lots of pets, and even a tidbit or two. Okay, I know you wanted to see the campground services. The shower is around the corner. The girl at the reception had told us that if we wanted hot water for the shower, we just had to light the fire. As in propane, right? Or at least that's what we thought. Wrong. You literally have to light a fire! Too funny. And the shower worked fine. Except for the first morning, when we woke up to no water at all because the elephants had come through during the night and torn up one of the waterlines from what we understood. Anyhow, the manager fixed it up and the water was back on when we returned later that day. Our activity for the day was to visit Twyfelfontein, another of our list of Unesco World Heritage sites. We tried to get there fairly early before it got too hot, but it was still 9:30am or so when we arrived. They have covered parking, so at least the truck stays in the shade. We paid N$50 each and N$20 for parking, so a total of N$120 ($13.00). This included our own guide, and we got the best guide! Not saying anything against the other 17 guides employed at Twyfelfontein, but our guide Elisabeth was great, and we felt really lucky to have spent an hour with her. Twyfelfontein is famous because of ancient rock engravings that were done between 2,000 and 6,000 years ago by the bushmen that lived in this region at the time. Elisabeth was really good at explaining what they think the meaning of the drawings are, and she put up with all of our questions about her personal life too! We wanted to know how she came to getting this job and where she lived and all that stuff! Elisabeth, telling us about some of the footprint engravings. How many different animals can you pick out here? One of the most famous figures in Twyfelfontein is the Lion Man. This lion has five toes on each foot (instead of four), and at the end of his bent tail is what looks like a human hand. The Lion Man represents a human who has turned into a lion while in the spirit world. We were done looking at a few of the rock engravings, but we wanted to see the water source that brought German-Jew David Levin to this area in 1946. He thought that he would be able to farm in this dry desolate area, but the underground water source was only able to produce one square meter of water per day and that was not enough to sustain a farm. 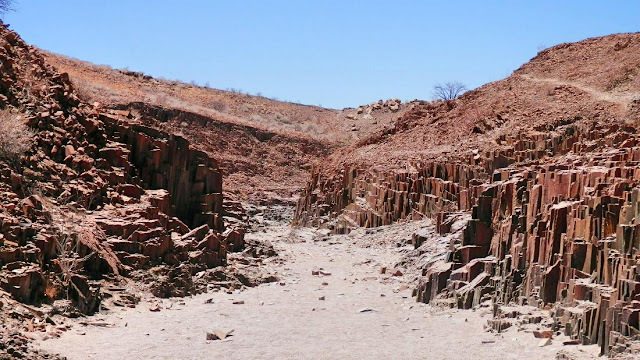 he named the spring "Twyfelfontein" which means "doubtful spring" because he thought the water would run dry before rainy season began. So we saw the spring, which continues running today, but it is just a trickle. Namibia is currently experiencing it's worst drought in 30 years and it hasn't rained in this area for two years! But, we did see a rock lizard. Elisabeth told us what it's proper name is, but we don't remember! From there, there are two other tourist attractions. They don't cost any money to visit, but they are only a short way down the road so we decided they were worth a visit. Maybe. The first one is called "Organ Pipes". It's a basalt rock formation, and it's worth a look to go for a walk down through the small valley where they are located. Ruth and Kevin at the Organ Pipes. Organ Pipes is worth it for a short walk. But another few kms down the road is "Burnt Mountain". Not worth the extra drive in our opinion. Just some dark colored rock, and yes it looks like there's been a fire there at some point but it's a bit of a stretch to make it a tourist attraction. Ruth took another bird picture and we can't identify it. She thought it looked like a robin of some sort but it looks more "hawk" like to me. We climbed a short hill near the camp around sunset. Another person showed up in the campground last night. David, was all by himself and it turned out he was from Czech Republic. We impressed him (not!) with our meager knowledge of the Czech language from our visit there in 2012. David went for dinner at the camp, and came back to say we were invited to join him and some others at a bar with some dancing and music, which we normally would have jumped at. But his car was full so we would have had to drive our own vehicle and we don't drive at night here. Also, we wanted an early start on Monday because we had a long drive to the touristy town of Swakupmond. More fun times and an interesting tour guide you had to boot. We don't drive at night either, to much wild life out there. such privacy in the toilet, reminds me that when kids are little might as well leave door open cause they are always going to want to talk anyway. great pics, those rock carvings are really interesting, lots of zebras and giraffes. Those Tilley hats are sure coming in handy. I can''t image in a million years having the adventure you two are enjoying. I think your robin/hawk might be a fish eagle. Keep your eyes out for an albatross, they are a huge bird! I'm really enjoying reading this and living vicariously through your travels. Love the energy saving hot water tank. I would probably opt for a cold shower, the ground water can't be that cold. Love your Tilly hat choices and bet we'll continue to see a lot of them n that heat! Great photos. A two year drought sounds terrible. How do the people and animals manage? Gorgeous rock art. Glad to see they require guides to see it. At least in this country it gets ruined when people are allowed to visit on their own. Hope Elisabeth gets to read your complimentary post on her. A great guide is a wonderful advantage. Ahhhh, Organ Pipe! We saw this type of rock formation in the mountains near the Prineville Dam in Oregon. Now I know the name of the formation...thanks. With 97 degrees air temperature, you probably could have taken a air warmed water shower. The sunset photo is wonderful. Just catching up on your travels and looks to be great fun and wow the wildlife is amazing.